IN VICENZA THE FOUNDER OF NORDIC WALKING. The alliance between orienteering and nordic walking is about to lead in Vicenza a special guest. 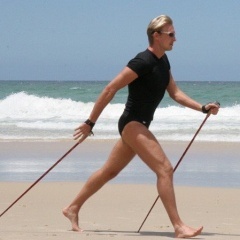 We are talking about Marko Kantaneva, founder of original nordic walking. Since 1996 Kantaneva dedicated his studies to the development of this sport, that since then started to spread all over the world. During the WMTBOC week the association Nordic Walking Vicenza is arranging the nordic walking side activities, which will be a great opportunity to explore the local area. There will be 5 stages, each one bound with a different subject: Culture, Art, History, Environment and Gastronomy. Walking side by side with the participants there will be Marko Kantaneva, to discover the beauties of Vicenza with a steady rhythmic pace. OFFICIAL BROCHURE IS ONLINE. The official brochure of the World Championship is now online, 'download' section. The publication was directed by the marketing office and Graphixline communication agency, creator of the motto "More value to the territory". CARTOGRAPHY TO ANGELO FRIGHETTO. With this section we want to introduce the persons who worked behind the scenes of the World Championship. Angelo Frighetto is in charge of the cartography for all the stages and surveyed the map of the Middle distance final. He has been important for the orgasining committee for his English knowledge, being born and raised in Australia. He also coordinated the training camps, that brought to Vicenza the top national team and athletes.